I hope the headline worked in getting your attention, because it’s not really true. No authentic Savage Sister ever throws anything away that still has life in it. But the pair of readers and its custom case featured in today’s post are so inexpensive, I don’t have to worry about breaking or losing them on a trip. 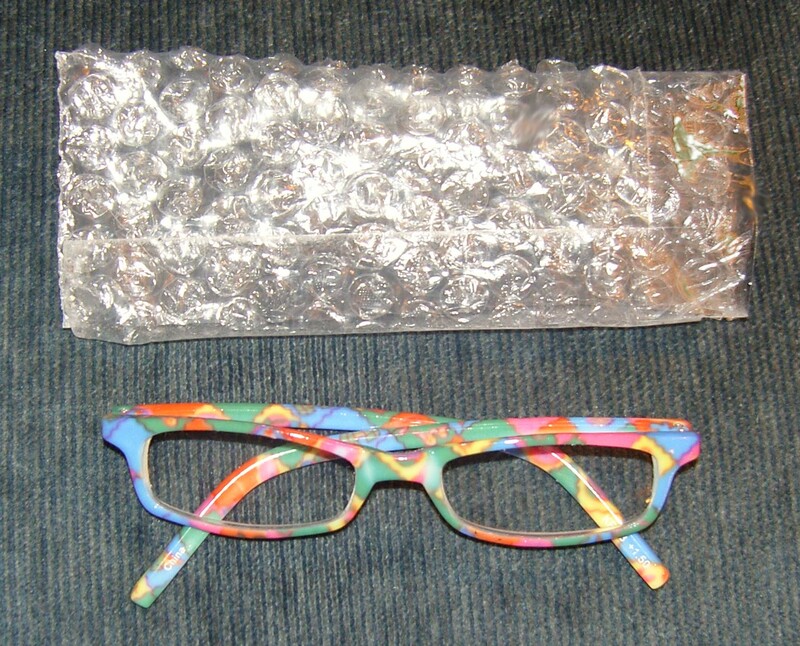 The reading glasses were fifty cents, and the bubble-wrap case was free. Both work great when I pack light for writing sessions. While at Goodwill a few months ago, I noticed a bowl of brand-new reading glasses marked down from $12.99 to two for a dollar. I looked carefully through the jumble, found two pairs in my current prescription, and plunked down a one-dollar bill. I usually buy my readers at the dollar store so I have plenty of spectacles to stash around the house. Goodwill’s deal was even better. The plastic glasses seemed perfect for an airplane trip I was going on a month later for a two-day writing marathon. I needed reading glasses for close-up work, and my hope was to manage the flight with just one personal item–my jungle bag. That meant packing extra light. I took the cheap readers so I didn’t have to worry about losing my more expensive bifocals. Allow me to digress for a moment. My “more expensive” bifocals were still a fantastic deal. I got them online at Zenni Optical and was impressed with the quality of both the eyewear and the customer service. If something ever happens to my bifocals, I won’t have to spend a lot to replace them. But a penny saved is a penny earned, and I’d still have to wait for new glasses to be made and shipped. So why take the risk? My new fifty-cent specs from Goodwill fit the need perfectly. I was going on the trip to write, not to win awards for haute couture. My next decision concerned a case. The plastic bag the glasses came in was too flimsy for protection, but I wanted something thinner and lighter in weight than my other cases. So I decided to try making my own case out of small leftover bubble wrap. I cut a section of bubble wrap twice as wide and a little longer than I needed. Then I folded it over horizontally and taped the long edge shut with clear packing tape. I also ran a length of tape around the top to stiffen the opening a bit. I figured that if the bubble-wrap case lasted even just one journey, it would be worth the effort. It actually held up for two trips. If I want to try for a third, I’ll need to add some tape to a bottom corner where the edges are lifting up a bit. The glasses themselves remain in great condition. Funny thing…so far, no one has tried to swipe them. This entry was posted in Pennywise Packing Pointers, Resourceful Recycling and tagged carryon, creative solutions, flying, packing, recycling. Bookmark the permalink.